What is the Difference Between Actual Possession and Constructive Possession of a Controlled Substance? What is Actual Possession of Drugs in Florida? One Florida court, Sasser v. State, 67 So. 3d 1150, 1152 (Fla. 2d DCA 2011) defined Actual Possession of Drugs in Florida as "[A]ctual possession is shown when contraband is found in the defendant's hand, or his person, or within reach and under the defendant's control." (quoting Bennett v. State, 46 So. 3d 1181, 1183-84 (Fla. 2d DCA 2010)). What is Constructive Possession of Drugs in Florida? To convict on a theory of constructive possession, the State is required to prove beyond a reasonable doubt (1) that the defendant had knowledge of the contraband and (2) that she had the ability to exercise dominion and control over the contraband. See Knight v. State, 186 So. 3d 1005, 1012 (Fla. 2016); Santiago v. State, 991 So. 2d 439, 441 (Fla. 2d DCA 2008). Another issue is what happens when drugs are found near the person arrested. You can learn more about how another court ruled on constructive possession of drugs found near a person in Florida here. we have written another article about questions that must be answered for a prosecutor to establish that a suspect has possessed drugs here. What happens where drugs are found in a room with more than one occupant? What happens where it looks like someone probably possessed drugs found elsewhere in the room? "However, "[w]here the only proof of guilt is circumstantial, no matter how strongly the evidence may suggest guilt, a conviction cannot be sustained unless the evidence is inconsistent with any reasonable hypothesis of innocence." Green v. State, 667 So. 2d 208, 212 (Fla. 2d DCA 1995) (alteration in original) (quoting State v. Law, 559 So. 2d 187, 188 (Fla. 1989)); see also Davis v. State, 761 So. 2d 1154, 1159 (Fla. 2d DCA 2000) ("Under the facts of this case, one could intuitively conclude that [the defendant] might be guilty. However, 'guilt cannot rest on mere probabilities.' " (quoting Arant v. State, 256 So. 2d 515, 516 (Fla. 1st DCA 1972))). Although the circumstances were indeed suspicious, suspicion is not enough to support a conviction. The fact remains where the State can offer no evidence inconsistent with the Defendant's hypothesis of innocence,the trial court is required to grant judgment of acquittal on that charge. "The court ruled that evidence of Constructive possession was too weak to establish that the defendant had dominion and control over marijuana found near him"
Tampa Possession of Marijuana Attorney has been researching constructive possession cases. In one recent case a Government official approached the defendant. The Defendant claimed that he was in a utility room with buddies to smoke. The court ruled the facts and evidence were not sufficient to prove that the defendant had constructively possessed marijuana. Court found that where a defendant's theory - that he was smoking tobacco, not marijuana, was reasonable, circumstantial evidence was not inconsistent with defendant's reasonable hypothesis of innocence. The court ruled that evidence of Constructive possession was too weak to establish that the defendant had dominion and control over marijuana found near him at time of the arrest. 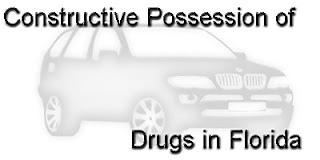 You can learn more about the difference between actual possession and constructive possession of drugs here. Florida Law provides: 893.13(6)(a) "It is unlawful for any person to be in actual or constructive possession of a controlled substance unless such controlled substance was lawfully obtained from a practitioner or pursuant to a valid prescription or order of a practitioner while acting in the course of his or her professional practice or to be in actual or constructive possession of a controlled substance except as otherwise authorized by this chapter. Any person who violates this provision commits a felony of the third degree, punishable as provided in s. 775.082, s. 775.083, or s. 775.084." Opinion filed August 12, 2016. Angela Tucker appeals her convictions for possession of paraphernalia and possession of methamphetamine. She was found guilty of those offenses after a jury trial and received a one-year sentence on the paraphernalia count and a concurrent five-year sentence on the methamphetamine count. We affirm the conviction on the paraphernalia count without comment. Because the evidence was legally insufficient to establish that Ms. Tucker constructively possessed methamphetamine, however, we are required to reverse the conviction on that count and to direct that the corresponding five-year sentence be vacated and that Ms. Tucker be immediately released. The State's evidence at trial was that two detectives went to a hotel room looking for Ms. Tucker's husband. When they knocked on the door, they saw Ms. Tucker look out the window and then identified themselves. Ms. Tucker did not open the door right away, so the detectives went around the back of the hotel to see if there was a rear exit. As they did so, one detective thought he heard a toilet flushing. Ms. Tucker thereafter opened the door, and the detectives explained that they were looking for her husband. When asked, Ms. Tucker stated that the room belonged to her and her husband. The detectives later confirmed that the room was registered to both of them. Ms. Tucker gave the detectives consent to search the hotel room. They observed both men's and women's clothing around the room and three garments hanging in the closet, including a large leather jacket that, according to the trial testimony, could have been a man's. There was no independent evidence that it belonged to Ms. Tucker. The inside left pocket contained fresh syringes and a cigarette pouch containing used ones. The right front pocket contained a metal cigarette holder that held a small baggie of methamphetamine inside. Ms. Tucker said nothing when the detective showed her the methamphetamine. The detectives later found two syringes in a nightstand drawer and saw blood spatter on the bed consistent with intravenous drug use. The detectives placed the syringes and methamphetamine on the bed, and Ms. Tucker stated that the items belonged to her husband. The detectives asked her if her DNA would show up on any of the used syringes from the jacket, and she said that it would because she had used them to shoot Roxycontin. The syringes were never tested, and we therefore do not know whether they contained residue of methamphetamine, Roxycontin, or something else. One detective described Ms. Tucker's demeanor as "antsy," said she did not appear surprised that he found the items, and testified that she never said "she didn't know those items were there." At the close of the State's case, Ms. Tucker moved for a judgment of acquittal on the ground, among others, that the State failed to present legally sufficient evidence showing that she possessed the methamphetamine found in the leather jacket. The trial court denied the motion, and the defense rested without presenting witnesses. After the jury returned guilty verdicts, Ms. Tucker made a renewed motion for judgment of acquittal and a motion for new trial, both of which were denied. On appeal, Ms. Tucker asserts that the trial court erred by not granting her motion for judgment of acquittal on the count for possession of methamphetamine. A motion for judgment of acquittal tests whether the evidence is legally sufficient to prove each element of the crime with which the defendant is charged. Nicholas v. State, 47 So. 3d 297, 300 (Fla. 2d DCA 2010) (citing State v. Odom, 862 So. 2d 56, 59 (Fla. 2d DCA 2003)). The question is whether, viewing the evidence in the light most favorable to the State, "a rational trier of fact could find the existence of the elements of the crime beyond a reasonable doubt." Westbrooks v. State, 145 So. 3d 874, 877 (Fla. 2d DCA 2014) (quoting Pagan v. State, 830 So. 2d 792, 803 (Fla. 2002)). Reviewing the matter possessed the methamphetamine found in the cigarette holder in the right front pocket of the jacket was not legally sufficient to support a conviction for that alleged offense. Ms. Tucker was not found in actual possession of methamphetamine: the contraband was in the pocket of a jacket hanging in a closet and was neither in her hand nor within her reach. See Sasser v. State, 67 So. 3d 1150, 1152 (Fla. 2d DCA 2011) ("[A]ctual possession is shown when contraband is found in the defendant's hand, or his person, or within reach and under the defendant's control." (quoting Bennett v. State, 46 So. 3d 1181, 1183-84 (Fla. 2d DCA 2010))). The issue at trial, therefore, was whether Ms. Tucker constructively possessed the methamphetamine. To convict Ms. Tucker on a theory of constructive possession, the State was required to prove beyond a reasonable doubt (1) that Ms. Tucker had knowledge of the contraband and (2) that she had the ability to exercise dominion and control over the contraband. See Knight v. State, 186 So. 3d 1005, 1012 (Fla. 2016); Santiago v. State, 991 So. 2d 439, 441 (Fla. 2d DCA 2008). Here, the State's proof of knowledge and the ability to exercise dominion and control rested entirely on circumstantial evidence. To find that Ms. Tucker knew about or had the ability to exercise dominion and control over the methamphetamine in the right outside pocket of the jacket, the jury would have had to make that inference from one or more of the incriminating circumstances supported by the trial evidence— for instance, from the fact that Ms. Tucker admitted to using the syringes found in the left inside pocket of the jacket. See Singleton v. State, 105 So. 3d 542, 544 (Fla. 2d DCA 2012) ("Circumstantial evidence is evidence which involves an additional inference to prove the material fact; e.g., 'I saw A flee the scene' is circumstantial evidence of A's guilt and direct evidence of flight." (quoting Charles W. Ehrhardt, Ehrhardt's Florida Evidence § 401.1 (2011 ed.)). When the State's proof of a defendant's guilt is wholly circumstantial, it is not sufficient that the proof is consistent with guilt; it must also be "inconsistent with any reasonable hypothesis of innocence." Jaramillo v. State, 417 So. 2d 257, 257 (Fla. 1982) (quoting McArthur v. State, 351 So. 2d 972, 976 n.12 (Fla. 1977)); see also Westbrooks, 145 So. 3d at 877. Because Ms. Tucker's guilt of possessing methamphetamine depended entirely on the State's circumstantial evidence regarding whether she had knowledge of and the ability to exercise dominion or control over that contraband, this standard applies to the State's proof in this case. See Knight, 186 So. 3d at 1009-12 (discussing the applicability of the circumstantial evidence standard in a constructive possession case). her husband's. This hypothesis was reasonable in that it was founded in the State's evidence at trial. Cf. Huff v. State, 495 So. 2d 145, 150 (Fla. 1986) (concluding that the appellant's hypothesis of innocence was unreasonable because "[n]o evidence whatsoever was introduced to support appellant's story . . . [and] all of the evidence adduced at trial . . . pointed to his guilt"). The hotel room was jointly occupied by Ms. Tucker and her husband, the jacket in which the methamphetamine was found was consistent with its being a man's jacket, and Ms. Tucker's statements to police were that the contraband contained therein belonged to her husband but that she had used the syringes found in a different pocket to inject Roxycontin. It would be reasonable to conclude from those facts that Ms. Tucker did not know about the methamphetamine and that she lacked the ability to exercise dominion or control over it. See, e.g., Wagner, 950 So. 2d at 513 (holding that the State failed to meet its burden in a constructive possession case based on circumstantial evidence where contraband was found in defendant's suits in a closet shared with his girlfriend and the girlfriend testified that the suits were a good hiding place); Winchell v. State, 362 So. 2d 992, 995 (Fla. 3d DCA 1978) (holding that evidence was insufficient to establish knowledge of contraband found on the rug and behind a radio in a jointly occupied motel room). The State's evidence was not inconsistent with Ms. Tucker's hypothesis. There was no evidence linking the methamphetamine to the syringes—for example, the results of a test showing that they had been used to inject that substance. There was no evidence concerning how and when Ms. Tucker came into possession of the syringes or how or when, once used, they came to be in the left inside pocket of the jacket. We do not mean to imply that the State must offer these particular facts in a constructive possession case based on circumstantial evidence. Rather, we reason that under the facts of this case, the State's evidence proves at most that Ms. Tucker at some point in time and under circumstances not established by the evidence used syringes that were later found in the pocket of a leather jacket that could well have been her husband's and was hanging in the closet of a hotel room she occupied jointly with him. Absent some circumstance that connects Ms. Tucker's use of those syringes to the methamphetamine, the State's evidence, although consistent with Ms. Tucker's guilt, is not inconsistent with her reasonable hypothesis that the methamphetamine was her husband's and that she neither knew about nor had the ability to exercise dominion and control over it. See, e.g., Wagner, 950 So. 2d at 513; Cook v. State, 571 So. 2d 530, 531 (Fla. 1st DCA 1990) (holding that State's wholly circumstantial evidence of constructive possession of a crack pipe in defendant's purse was insufficient to rebut reasonable hypothesis of innocence where defendant left purse on a bar accessible to others while dancing). The State argues that Ms. Tucker's statements that her DNA would be on the used syringes found in the jacket and that the contraband was her husband's necessarily draw a connection between her and the methamphetamine sufficient to establish constructive possession. We disagree. Because the syringes were located in a different jacket pocket from the pocket containing the cigarette case with methamphetamine, Ms. Tucker's admission to using those syringes to shoot Roxycontin does not necessarily link her to constructive possession of the methamphetamine. In actual or constructive possession of one item of contraband was legally insufficient to establish that defendant's knowledge of or dominion and control over another item of contraband in the same premises. See, e.g., Rangel v. State, 110 So. 3d 41, 46 (Fla. 2d DCA 2013) ("Mr. Rangel's actual possession of one type of narcotic does not permit the inference that he possessed a different type of narcotic concealed in a vehicle that he did not own. "); Santiago, 991 So. 2d at 442 (holding that defendant's constructive possession of heroin found in plain view in a jointly occupied apartment was legally insufficient to establish constructive possession of drugs in various other places throughout apartment); Culver v. State, 990 So. 2d 1206, 1209-10 (Fla. 2d DCA 2008) (holding that the defendant's actual possession of cocaine was insufficient to prove constructive possession of other narcotics found in another area of her jointly occupied vehicle). Under the facts of this case, Ms. Tucker's admission to having possessed syringes found in one jacket pocket for purposes of injecting Roxycontin, without more, was not sufficient to rebut the reasonable hypothesis that the methamphetamine found in another pocket of the same jacket belonged to her husband and that she was unaware of and lacked the ability to exercise control over it. Likewise, on the face of it, Ms. Tucker's statement that the contraband items were her husband's is entirely consistent with a disavowal of knowledge of and dominion and control over the methamphetamine. As such, the statement supports rather than contradicts her reasonable hypothesis of innocence. See Wagner, 950 So. 2d at 513 (holding that defendant's statement that officers "planted" drugs in his house was insufficient "to establish beyond a reasonable doubt his knowledge of the presence . . .
State argues that Woods' statement '[t]hey planted it on me' would allow the trier of fact to infer knowledge of the cocaine's presence and is inconsistent with Woods' reasonable hypothesis of innocence. The record, however, does not bear this out. . . . Woods' statement disclaims possession or ownership. . . . and [is] entirely consistent with Woods' reasonable hypothesis of innocence." (first alteration in original)). The State also maintains that the suspicious nature of the circumstances is sufficient to support the trial court's denial of Ms. Tucker's motion for judgment of acquittal. However, "[w]here the only proof of guilt is circumstantial, no matter how strongly the evidence may suggest guilt, a conviction cannot be sustained unless the evidence is inconsistent with any reasonable hypothesis of innocence." Green v. State, 667 So. 2d 208, 212 (Fla. 2d DCA 1995) (alteration in original) (quoting State v. Law, 559 So. 2d 187, 188 (Fla. 1989)); see also Davis v. State, 761 So. 2d 1154, 1159 (Fla. 2d DCA 2000) ("Under the facts of this case, one could intuitively conclude that [the defendant] might be guilty. However, 'guilt cannot rest on mere probabilities.' " (quoting Arant v. State, 256 So. 2d 515, 516 (Fla. 1st DCA 1972))). Although the circumstances were indeed suspicious, suspicion is not enough to support a conviction. The fact remains that the State offered no evidence inconsistent with Ms. Tucker's hypothesis of innocence, and that fact required the trial court to grant judgment of acquittal on that charge. Accordingly, while we affirm Ms. Tucker's conviction for possession of paraphernalia, we must reverse her conviction and sentence for possession of methamphetamine. Because double jeopardy forecloses a retrial for that alleged offense and Ms. Tucker has already served her one-year sentence for possession of paraphernalia, we remand with instructions that the trial court vacate the judgment and sentence for that charge and order Ms. Tucker's immediate release. See Stenson v. State, 756 So. 2d 118, 120 (Fla. 3d DCA 2000); see also Webster v. State, 549 So. 2d 784 (Fla. 4th DCA 1989). Affirmed in part; reversed in part; remanded with instructions. LaROSE and SLEET, JJ., Concur. Appeal from the Circuit Court for Polk County; Roger A. Alcott, Judge. Amanda Peterson of Law Offices of Peterson, P.A., Mulberry, for Appellant. Pamela Jo Bondi, Attorney General, Tallahassee, and Gillian N. Leytham, Assistant Attorney General, Tampa, for Appellee.